Indonesia, officially the Republic of Indonesia (Bahasa Indonesia: Republik Indonesia), is a vast nation consisting of more than 18,000 islands in the South East Asian Archipelago, and is the world's largest archipelagic nation. 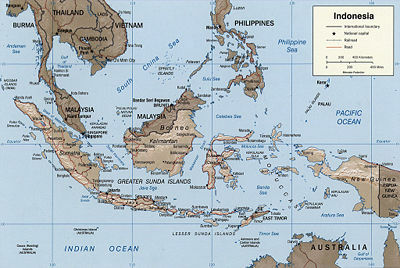 The name "Indonesia" derives from Greek "indus" or "India," and "nesos" or "islands"). It is home to more than 200 million people, and thus is the most populous Muslim-majority nation in the world and the fourth most populous overall. Indonesia was governed by Sukarno, leader of the national independence struggle, and military dictator Suharto, for most of its recent history. Democracy was restored following the Indonesian Revolution of 1998. The national language is Bahasa Indonesia and the population is overwhelmingly Muslim. However, there are several hundred diverse linguistic and ethnic groups across the country, as well as other religious communities. Although Indonesia's economy is progressive and regionally important, the problems of poverty, illiteracy, political instability, and regional separatism remain major issues hindering national development. Indonesia's 18,108 islands, of which about seven thousand are inhabited, are scattered around the equator, giving the country a tropical climate. The coastal plains average 82° F (28° C), and the higher mountain regions, 73° F (23° C). Western Sumatra, Java, Bali, the interiors of Kalimantan, Sulawesi, and Western New Guinea are the wettest, with rainfall of more than 78 inches (2,000 millimeters) per year. The city of Bogor, near Jakarta, lays claim to having to world's highest number of rainstorms per year, with 322. Indonesia's largest islands are Java, one of the most densely populated regions on Earth (where about half of the population lives), Sumatra, Borneo (shared with Malaysia and Brunei), New Guinea (shared with Papua New Guinea) and Sulawesi, also known as Celebes. It is bordered by the nations of Papua New Guinea, East Timor, Singapore, Australia, and Malaysia. In addition to the capital city of Jakarta, principal cities include Surabaya, Bandung, Medan, Palembang, and Semarang. Its location on the edges of the Pacific, Eurasian, and Australian tectonic plates means Indonesia has frequent earthquakes and the resulting tsunamis. 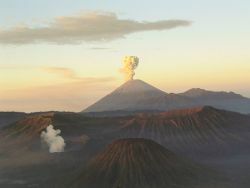 Indonesia also has many volcanoes, the most famous being the now-vanished Krakatoa, which was located between Sumatra and Java and erupted explosively in 1883. 36,000 West Javans died in the resulting tidal wave. The sound of the explosion was reported as far away as Turkey and Japan. Between 1972 and 1991, 29 volcanic eruptions were recorded, mostly on Java. Mountains ranging between 9,800 and 12,460 feet (3,000 to 3,800 meters) above sea level can be found on the islands of Sumatra, Java, Bali, Lombok, Sulawesi, and Seram. The highest peak, Puncak Jaya, also known as Mount Carstenz, reaches over 16,000 feet (4884 meters), and is located in the Sudirman Mountains in Western New Guinea. Flora and fauna differ markedly between Kalimantan, Bali, and western islands on the one hand and Sulawesi (Celebes), Lombok, and islands further east on the other. This ecological boundary, called the Wallace Line after its discoverer, Alfred Russel Wallace, is often given as the boundary between Asia and Australasia. 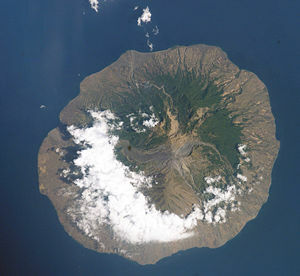 Indonesia is a country with many volcanic islands. Sangeang Api Island is an example. Indonesia faces environmental challenges. Coastal waters contaminated by pollution from agricultural pesticides and off-shore oil drilling caused fish stocks to decline, threatening the livelihood of fishing people and those engaged in allied activities—roughly 5.6 million people. Deforestation, soil erosion, massive forest fires, and even desertification, resulting from intensive commercial logging, threatens the mountainous interior regions of Kalimantan, Sulawesi, and Sumatra. In 1983 some 11,580 square miles (30,000 square kilometers) of prime tropical forest worth at least U.S. $10 billion were destroyed in a fire in Kalimantan Timur Province. The disastrous scale of this fire was a result of the piles of dead wood left behind by the timber industry. Even discounting the calamitous effects of the fire, in the mid-1980s Indonesia's deforestation rate was the highest in Southeast Asia, at about 2,702 square miles (7,000 sq. km) per year. The area now comprising the archipelago of Indonesia, specifically Java, was inhabited by Homo erectus approximately 500,000 years ago, while the island of Flores was home to a newly discovered species of hominid, Homo floresiensis, until approximately 10,000 years ago. The date of the earliest arrival of Homo sapiens to the area was between 40,000 and 100,000 years ago. The earliest historical mention of the area was of the Jawa Dwipa Hindu kingdom in Java and Sumatra around 200 B.C.E. by Indian scholars. Various archeological sites show the influence of the Hindu religion in the area from the first century to the fifth century C.E. Under the influences of Hinduism and Buddhism, several kingdoms formed on the islands of Sumatra and Java from the seventh to fourteenth century. Arab spice traders brought Islam, which became the dominant religion in many parts of the archipelago after the collapse of Hindu and Buddhist kingdoms. When the Portuguese arrived in the early sixteenth century, they found numerous small states vulnerable to conquest; later, other Europeans seeking to dominate the spice trade arrived. In the seventeenth century, the Dutch ousted the Spanish and Portuguese (except for the Portuguese colony on the island of Timor). Dutch influence began with the Dutch East India Company (VOC), a chartered private enterprise complete with its own fleet and army, which gradually expanded its control. Like the British, the Dutch mainly relied on indirect rule, using local elites as vassals, while imposing their will and extracting wealth. The VOC was dissolved in 1799, and the East Indies was awarded to the then United Kingdom of the Netherlands in 1815. Under the nineteenth-century Cultivation System (Cultuurstelsel), large plantations and forced cultivation were established on Java, finally creating the profit for the Netherlands that the VOC had been unable to produce. In a more liberal period of colonial rule after 1870, the Cultivation System was abolished, and after 1901 the Dutch introduced the Ethical Policy, which included limited political reform and increased investment in the colony. During World War II, with the Netherlands under German occupation, Japan began a five-prong campaign in December 1941 towards Java and the vital fuel supplies of the Dutch East Indies. Japan captured Java by March 1942, and erected an occupation government, installing Sukarno, a pro-independence activist imprisoned by the Dutch, as its head. From 1942, Sukarno collaborated with the Japanese occupiers. In later life, he refused to talk about the war years. In 1945 with the war drawing to a close, Sukarno sought to declare independence with Japan's permission. However, Sukarno and Mohammad Hatta declared independence unilaterally on August 17, soon after the Japanese lost the war. With Japan defeated, the Netherlands' Army, at first backed by the British, attempted to reoccupy their former East Indies colonies. Indonesia's war for independence lasted from 1945 until December 27, 1949, when, under international pressure, especially from the United States (which threatened to cut off Marshall Plan funds), the Netherlands acknowledged the independence of Indonesia as a federation of autonomous states. This federation soon became a republic with Sukarno as president and Hatta as vice president. It was not until August 16, 2005, that the Dutch government recognized 1945 as the country's year of independence. During the 1950s and 1960s, Sukarno's government aligned first with the emerging non-aligned movement, and later with the socialist bloc. The 1960s brought a military confrontation with neighboring Malaysia, and increasing frustration over domestic economic difficulties. 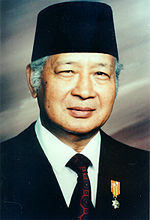 Suharto was the military president of Indonesia from 1967 to 1998. General Suharto of the Indonesian Army became president in 1967 on the pretext of securing the country against an alleged communist coup attempt against a weakening Sukarno, whose tilt leftward had alarmed both the military and Western powers. Suharto's administration is commonly called the New Order and ushered in an era when hundreds of thousands of people were killed or imprisoned by military and religious groups in a backlash against alleged communist supporters. He also annexed East Timor, despite massive protest. Suharto invited foreign investment, which produced substantial—albeit uneven—economic growth. However, Suharto enriched himself and his family and was forced to step down in 1998 amid massive demonstrations and a faltering economy. Vice President Habibie was named the new Indonesian president. A one-time aircraft designer and former Indonesian minister of research and technology, President Habibie promised a multiparty, democratic election in 1999 and encouraged freedom of the press. His presidency was plagued by various bloody conflicts, both long-running ones in Aceh province and West New Guinea, and new ones in Maluku, Poso (Sulawesi), and Kalimantan. There was a financial scandal (Bank Bali case) related to his friends and the staff of his political party. On 1999 President Habibie agreed to hold a referendum on independence for East Timor. The result of the referendum was an overwhelming vote for independence from Indonesia. This resulted in a bloody riot in East Timor by the angry pro-Indonesia militia. The United Nations sent a peacekeeping force, and the UN Human Rights Commission alleged that several Indonesian government staff and military officers were responsible for the riot. The Indonesian Human Rights Court freed all but one suspect, Enrico Gutierrez, a former leader of the pro-Indonesia militia. President Habibie resigned, to be replaced by K.H. Abdulrahman Wahid as the new President from 1999 to 2004. From 1998 to 2005, the country had four presidents: Bacharuddin Jusuf (B.J.) Habibie (1998 to 1999), Abdurrahman Wahid (1999 to 2001), Megawati Sukarnoputri (2001 to 2004) and Susilo Bambang Yudhoyono (from 2004 on). President Wahid was the leader of the powerful Indonesian Islamic organization, Nadathul Ulama (he was plagued by serious health problems due to a stroke suffered before he became president). Megawati Sukarnoputri, the daughter of the first president, Sukarno, became vice president. A further corruption scandal (the Bulog fund) and a political crisis in 2001 forced Wahid to resign. Megawati Sukarnoputri, the leader of PDI-P, the winner of 1999 election, replaced him as president from 2001 to 2004. Indonesia's first direct presidential election was held in 2004, and won by Susilo Bambang Yudhoyono. It was the largest one-day election in the world. A massive earthquake and tsunami on December 26, 2004, devastated parts of northern Sumatra, particularly the Aceh province. In March 2005, a powerful earthquake destroyed most buildings on Nias Island, west of Sumatra. Hundreds of people were killed. Peace talks between the Indonesian government and Gerakan Aceh Merdeka (GAM, the Free Aceh Movement) were restarted and resulted in a peace agreement. Indonesia is a republic with a presidential system, and a unitary state with power concentrated in the national government. The president of Indonesia is directly elected for five-year terms, and is the head of state, commander-in-chief of Indonesian armed forces, and responsible for domestic governance, policy-making, and foreign affairs. The president appoints a council of ministers, which may or may not be elected members of the legislature. The highest legislative body is the Majelis Permusyawaratan Rakyat (MPR) or People's Consultative Assembly, consisting of the Dewan Perwakilan Rakyat (DPR) or People's Representative Council, elected for a five-year term, and the Dewan Perwakilan Daerah (DPD) or Regional Representatives Council. Following elections in 2004, the MPR became a bicameral parliament, with the creation of the DPD as its second chamber in an effort to increase regional representation. During the regime of President Suharto, Indonesia built strong relations with the United States and had difficult relations with the People's Republic of China owing to Indonesia's anti-communist policies and domestic tensions with the Chinese community. It received international condemnation for its annexation of East Timor in 1978. Indonesia is a founding member of the Association of South East Asian Nations, and thereby a member of both ASEAN+3 and the East Asia Summit. Since the 1980s, Indonesia has worked to develop close political and economic ties between South East Asian nations, and is also influential in the Organization of Islamic Conference. Indonesia was heavily criticized between 1998 and 1999 for allegedly suppressing human rights in East Timor, and for supporting violence against the East Timorese following the latter's secession and independence in 1999. Since 2001, the government of Indonesia has co-operated with the U.S. in cracking down on Islamic fundamentalism and terrorist groups. Indonesia has 33 provinces, which are subdivided into regencies and cities, which are in turn split up in sub-districts. Aceh, Jakarta, Papua, and Yogyakarta have special status, giving them more autonomy from the central government. The Acehnese government has the right to create an independent legal system, and instituted a form of Shariah (Islamic Law) in 2003. Yogyakarta remains a sultanate whose sultan (currently the widely popular Sri Sultan Hamengkubuwono X) is the territory's de facto governor for life. The special capital region is Jakarta; though a city, it is administered much as any other Indonesian province. East Timor was occupied by Indonesia from 1975 following a military invasion, until Indonesia relinquished its claims in 1999 after years of bitter fighting against East Timor guerrillas and abuses by Indonesian military forces against the East Timorese civilians. Following a period of transitional administration by the United Nations, it became an independent state in 2002. Fighting broke out in mid-2006, requiring troops from Australia and New Zealand, and armed police from Portugal. Indonesia, a vast nation, has struggled with the consequences of the Asian financial crisis of the early twenty-first century, and has high unemployment, a fragile banking sector, endemic corruption, inadequate infrastructure, a poor investment climate, and unequal resource distribution. Indonesia became an oil importer in 2004 because of declining production and lack of new exploration. The cost of subsidizing domestic fuel strained the national budget in 2005, and with an indecisive monetary policy, contributed to a run on the currency, prompting the government to raise the average fuel price by 126 percent. The resulting inflation and interest rate increases were expected to dampen growth prospects. In December 2004, the Indian Ocean tsunami took 131,000 lives, left another 37,000 missing, displaced 570,000 people, and caused an estimated U.S. $4.5 billion in damages and losses. Islamist terrorist incidents in 2005 slowed tourism. Several human cases of avian influenza in late 2005 sparked fears of a pandemic. Keys to economic growth include internal reform, and gaining the confidence of international and domestic investors. The country has extensive natural resources outside Java, including crude oil, natural gas, tin, copper and gold. Indonesia is the world's second-largest exporter of natural gas. Agricultural products include palm oil, rice, tea, coffee, spices, and rubber. The central bank is Bank Indonesia. Indonesia had a labor force of 94.2 million in 2005, of which 46.5 percent worked in agriculture, 11.8 percent in industry, and 41.7 percent in services. About 16.7 percent are below the poverty line. Exports totaled U.S. $83.64 billion in 2005. Export commodities included oil and gas, electrical appliances, plywood, textiles, and rubber. Export partners were Japan (22.3 percent of total exports), the U.S. (12.3) percent, Singapore (8.4 percent), South Korea (6.8 percent), China (6.4 percent), and Malaysia 4.2 percent). Imports totaled $62.02-billion in 2005. Import commodities included machinery and equipment, chemicals, fuels, foodstuffs. Import partners were Singapore (13.1 percent), Japan (13.1 percent), China (8.8 percent), the U.S. (7 percent), Thailand (6 percent), Australia (4.8 percent), Saudi Arabia (4.2 percent), and South Korea (4.2 percent). Indonesia still receives bilateral aid through the Consultative Group on Indonesia, which pledged $2.8 billion in grants and loans for 2004 and again in 2005. Nearly $5 billion in aid money was pledged by a variety of bilateral, multilateral, and non-governmental organization donors following the 2004 tsunami. The money is tagged for use in relief and rebuilding efforts in Aceh. Indonesia's population statistics are difficult to estimate. The country's Central Statistics Bureau quotes 219.9 million as the population for 2005, while the CIA World Factbook estimates are over 240 million. Some parts of Indonesia are among the most densely populated areas in the world. Java is the most populous island, and many Indonesian cities are some of the most populous and densely populated. The west of the country is Asian and the people are mostly Malay, while the east is more Pacific and people on New Guinea are Papuan, with roots in the islands of Melanesia. There are, however, many more subdivisions—since Indonesia spans an area the size of Europe or the U.S. and consists of many islands that developed separately. Many Indonesians identify with a more specific ethnic group, such as Javanese, Sundanese, or Batak. There are quite different groups within many islands, such as Borneo, with its Dayak and Punan, who have different lifestyles and skin-tones. The total number of languages/ethnic groups for Indonesia is 742, and the province of Papua alone has some 269 different ethnic groups. Indonesia has ethnic tensions, particularly between Indonesians of Chinese ethnicity and the Pribumi peoples, who are considered natives of Indonesia. Non-Pribumi people are not always considered entirely Indonesian. Riots in Jakarta in 1997 and 1998 highlighted this recurring tension. Ethnic relations are strained mostly due to a perception that the Chinese community is too wealthy relative to the Pribumis. Some of the resentment rose against shopkeepers and small-time creditors who constitute much of the Chinese Indonesian community. Under Dutch rule, Chinese were used as middlemen and treated as second-class citizens, while Pribumi peasants and laborers were treated as third-class citizens. Chinese-owned shops, and the families living and working in storefront dwellings were the target of much of the wrath of the rioters. The Indonesian government has taken steps to remedy the problem. Additionally, the corruption, collusion, and nepotism ('KKN' is the Indonesian abbreviation) which characterized Suharto's presidency increased public resentment that led to the eventual downfall of the regime but also exacerbated ethnic tensions in Indonesia. Ethnic conflict also exists between local ethnic groups and the Javanese and Madurese people relocated by the central government. 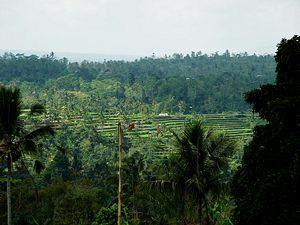 This type of conflict can often take on religious overtones as Muslim Javanese and Madurese find themselves in areas that were predominantly Christian or animist. One example of this occurred in West Kalimantan, where members of the local Dayak community massacred hundreds of Madurese. Other such conflicts have occurred in Ambon City, Sulawesi Tengah, and parts of Western New Guinea (formerly known as Irian Jaya). Most Indonesians speak at least one of hundreds of local languages (bahasa daerah). The official national language, called "Bahasa Indonesia" in Indonesian, is taught in schools and is spoken by nearly every Indonesian. It was a lingua franca for the region, including present-day Malaysia (and is closely related to the Malay language), was accepted by the Dutch as the de facto language for the colony, and declared the official language after independence. English is the most widely spoken foreign language. A number of Chinese dialects, most prominently Min Nan, are also spoken. The public use of Mandarin Chinese, especially Chinese characters, was discouraged between 1966 and 1998. The formerly large, influential Eurasian community (locally known as Indo) has largely left the country for the Netherlands, California in the U.S., and Australia, but some Eurasians remain in Indonesia and among them are highly esteemed models and soap opera stars. Almost 88 percent of Indonesians reported their religion as Muslim in the 2000 census, making Indonesia the most populous Muslim-majority nation in the world. Eight percent are Christian (of which roughly 75 percent are Protestant, the remainder mainly Catholic, and a large minority Charismatic), three percent Hindu and one percent Buddhist. Indonesians are required to declare themselves as one of these official religions. As a result, many Indonesian "Muslims" are non-practicing, follow Indonesia's animist traditions, or are entirely secular. Before the arrival of Christianity and Islam, popular beliefs were influenced by Hinduism and Buddhism. Although Islam was once mainly limited to Java and parts of Sumatra, the transmigration program has increased the number of Muslims living in Bali, Borneo, the Celebes, the Moluccas, and Papua. After independence, syncretism (the combining of different religious forms) and intermarriage have decreased and religious divides sharpened, leading to violence in many eastern islands and in Java. In Java, in particular, a substantial number of Muslims follow a non-orthodox, Hindu-influenced form of Islam known as Abangan, while across the archipelago the Hindu legacy, along with the older mystic traditions, influences popular beliefs. The Dutch introduced a system of formal education, although this was restricted to certain privileged children. The system they introduced was roughly similar to the current structure. Education in Indonesia is the responsibility of the Department of Education. From birth until the age of five, Indonesian children do not have access to formal education. From the age of five to seven, they attend kindergarten. Students attend middle school for three years from the age of 13 to 15, then may move on to high school or college, or cease formal education. High school or college comprises three years of schooling, from the age of 16 to 18. After graduation, students may enter the workforce, or continue with higher education at a university. A total of 87.9 percent of the population over the age of 15 can read and write. 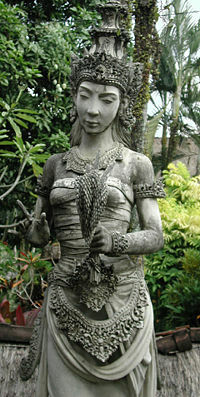 Art forms in Indonesia have been influenced by several cultures. The famous Javanese and Balinese dances, for example, contain aspects of Hindu culture and mythology. 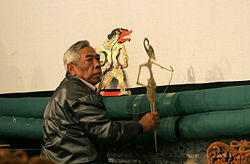 Also well-known are the Javanese and Balinese wayang kulit shadow theatre shows, displaying several mythological events. Pencak Silat is a unique martial art originating from the archipelago. Among the popular art forms of Java are: Reog from Ponorogo, Kethoprak in Central and East Java, and Angguk and Jathilan around Purwokerto. Several Islands are famous for their batik, ikat, and songket cloth. Once on the brink of disappearing, batik, and later, ikat, received renewed interest when former President Suharto began wearing batik shirts on official occasions. Indonesia has a long-standing tradition of sculpture and carving. Examples of Indonesian sculpture have been found dating back to the Bronze and Iron ages, but the artform particularly flourished in the eighth to tenth centuries, both as individual works of art, and as incorporated into temple structures. Most notable are the hundreds of meters of relief sculpture at the temple of Borobodur in Central Java. There, approximately two miles (3,800 meters) of exquisite relief sculpture tell the story of the life of Buddha and illustrate his teachings. The temple was originally home to 504 statues of the seated Buddha. In the twentieth century, Bali saw a flourishing of its artistic communities, especially painting. Batik and sculpture developed in new directions, combining traditional methods with contemporary themes and techniques. Although many of the Balinese sculpture workshops now cater to the tourist trade, there is a vibrant sculptural tradition in Bali, especially around Ubud. Long houses in Sulawesi and Sumatra are adorned with carved relief, and the structures of the buildings themselves are often carved. Primitive animistic carvings are still made in Sulawesi and elsewhere, although much of this is now made for sale to tourists. In Tana Toraja, effigies of the dead are carved. In New Guinea, Bisj Poles of up to 25 meters are carved from a single piece of mangrove tree, adorned with human figures, animals and other totems. Indonesia is home to hundreds of forms of music and dance. The best-known traditional or classical music from Central/East Java and Bali is the Gamelan. Traditional dances depict episodes from the Ramayana and Mahabharata from India. A very popular modern style of music is Dangdut, with an accompanying free dance style. Many political rallies have Dangdut performances to attract crowds. Dangdut, which first surfaced during the 1970s, has a distinct Indian sound. Keroncong is said to have its roots in Portugal, brought to Indonesia by Portuguese traders in the fifteenth century. Most popular in the twentieth century, keroncong is now often considered "old people's" music. A more modern form of keroncong is called Pop Keroncong. Completely different is the soft Sasando music from West Timor in the province of East Nusa Tenggara. Sasando is an instrument made from a leaf of the lontar palm and bears some resemblance to a harp. Pramoedya Ananta Toer was Indonesia's most internationally celebrated author, having won the Magsaysay Award as well as being considered for the Nobel Prize in Literature. Other important figures include the late Chairil Anwar, a poet and member of the Generation 45 group of authors who were active in the Indonesian independence movement. There is a long tradition in Indonesia, and particularly among ethnically Malay populations, of extemporary, interactive, verbal composition of poetry. These poems are referred to as pantun. ↑ William H. Frederick and Robert L. Worden (eds. ), Pancasila Indonesia: A Country Study (Claitor's Law Books and Publishing Division, 2005). Retrieved November 28, 2017. ↑ Adrian Vickers, A History of Modern Indonesia (Cambridge University Press, 2005, ISBN 0521542626). ↑ 3.0 3.1 3.2 3.3 3.4 Indonesia. International Monetary Fund. Retrieved November 28, 2017. This page was last modified on 2 March 2018, at 20:56.